Chinese skirt styles are often called aprons and are typically comprised of two identical sections, each with a decorated panel, a side panel and a pleated or gored panel. They were worn overlapping, wrapped around the body and secured through fabric loops and knotted buttons. The sections were attached to a wide waistband, usually made of cotton or hemp so that the silken fabric of the skirt would not slip down. Only Han women wore skirts, not the Manchu women of the ruling Qing dynasty, and they were worn on formal occasions together with trousers and jackets. This explains why the panels were only embroidered to where the jacket meets the skirt. This skirt is embroidered with phoenixes set amid flowers and scrolling borders. This skirt style is known as the ma mian qun馬面裙(horse face skirt) but skirts were subject to numerous fashion changes, many of which revolved around their very poetic names. The seventeenth-century dramatist and commentator Li Yu李漁 (1611-1680?) wrote of how, “Recently in Suzhou the fashionable ‘hundred pleated skirt’ (bai jian qun百襇裙) is considered very beautiful.… but there is a new style, the so-called ‘moonlight skirt’ (yue hua qun月華裙) – with many colors set within each pleat, as if reflecting the light of a brightly lit moon.” During the late nineteenth-century, another fashionable style was the ‘fish-scale’ skirt, with hundreds of tiny pleats, each secured with horizontal stitches that divided the pleats into sections resembling fish scales. 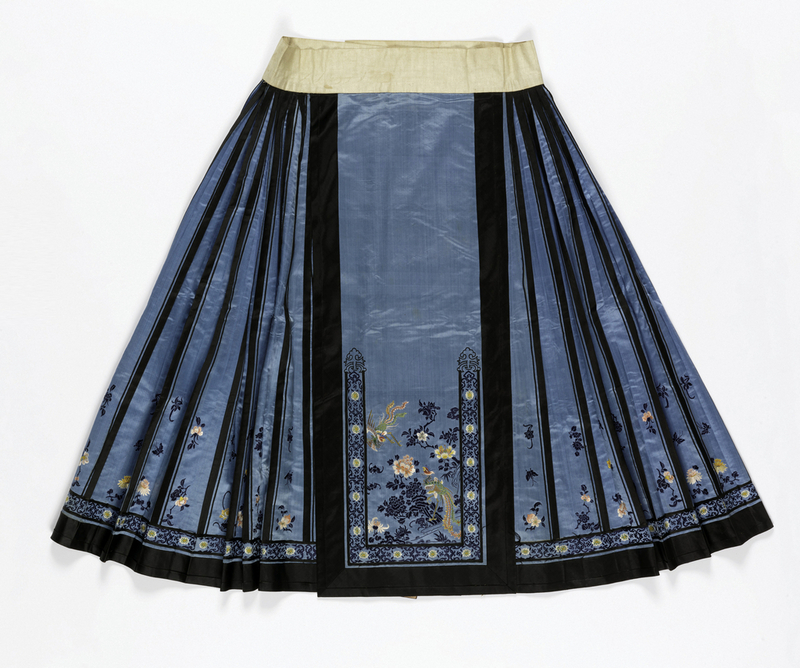 Skirt, China, 19th century, silk satin, embroidered with silk, Gift of the Estate of Mrs. Robert H. Patterson, 1941-31-31.